As I may have mentioned in previous posts, I from time to time work for Temple on saturdays helping with presentations to prospective Japanese high school students. Parts of my duties include giving a 'how is life in Japan as a foreigner' speech in both Japanese and English, giving tours, and talking one-on-one with students to give them a warm student body feel of the TUJ students. It's given me a good opportunity to feel more comftorable speaking in front of large groups in a foreign language and a chance to make some cool friends. One of the great perks of the gig is they occasionally ask me to do high school visits like covered in previous posts. 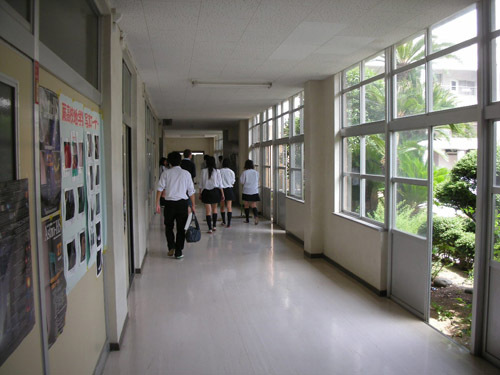 Once a year though, we make a trip out to Warabi High School in Saitama with about 10 TUJ students and we enjoy sharing a day-in-the-life with Japanese high school kids. I always thought it would be awesome to get a chance to actually sit in on Japanese classes in sessions and see how things actually run as opposed to just coming in to do a presentation about Temple. So that's where this story starts. 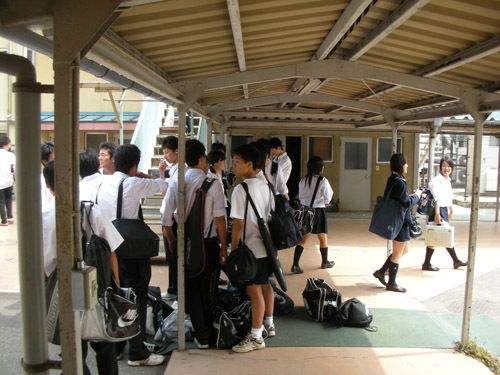 In the morning we met up with our TUJ representative at the station closest to the Warabi High School. Once we had collected all of the students from our group we moved on to meet a few cars waiting to take us to the school. Thank god too because it was retardedly hot outside with humidity through the roof. A point to mention, if you ever visit Japan, never ever ever come in August unless you enjoy doing unpleasant things to yourself. 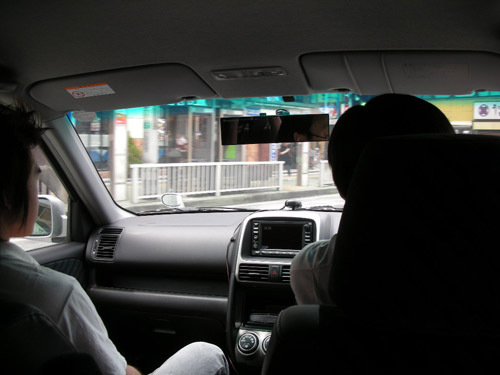 Here I am cruising in the back seat of one of the teachers' cars. As evidenced here, pretty much everybody has navigation in their cars, makes me quite jealous. Also, in the front seat you can see our fresh new Korean transfer student Pill. I'm probably spelling his name horribly wrong but that's how it's pronounced in English so who cares. 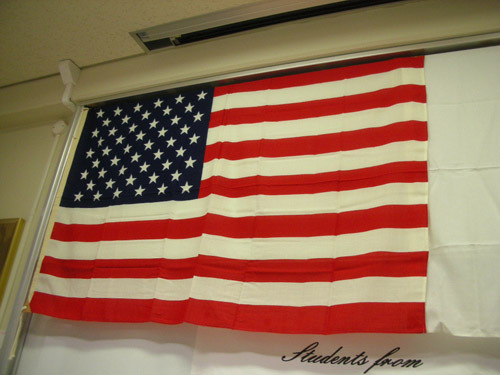 As they lead us through the campus into the meeting room where we'd be eating lunch with the Japanese students, we were met with massive flags slapped on the wall. Funny thing is only a few of the 10 or so students from Temple were American so they were a little butthurt they got left out. here I am anxiously awaiting the days events. You can see Jon, one of our other American students, chatting away as he commonly does. Unfortunately this day I was running a high fever (and 3 days later was hospitalized with Measles, but more on that later) so I wasn't feeling too super. 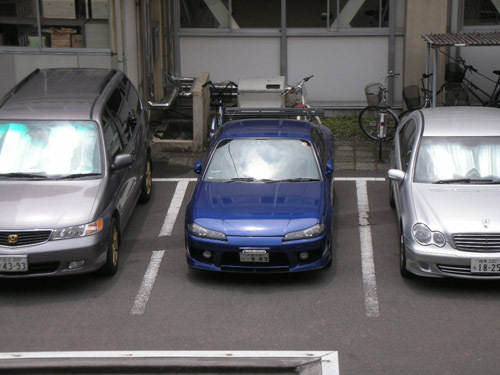 ZOMG One of the teachers that work at this school has a zesty blue S15 Spec R Silvia. If I could find out who it is, I'd chee-to chop him for the keys. We were soon met by a pack of high school students who did a short introduction about their school in English. They then proceeded to break us up in a couple groups and led us around the campus on a tour where we had an opportunity to sit in on some classes. 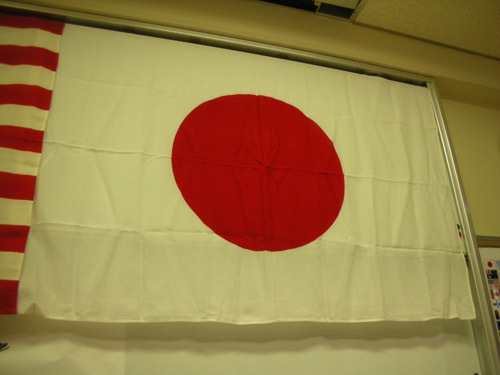 Here we are hanging out in the back of the room in Japanese History class. The high school students kept turning back to scope out our vanilla faces. It was a crazy feeling actually sitting in the class and seeing what we've seen in movies or manga stateside. Also, when we'd walk into classes and the teacher noticed our presence, they began talking louder and more articulate for whichever reason. One teacher even kept referring to us in his lecture and looking to us for confirmation to move on to the next point, I guess to see if we understood what he was saying at all. This man helped lead us around as well through the halls. This is the second floor of one of the wings. 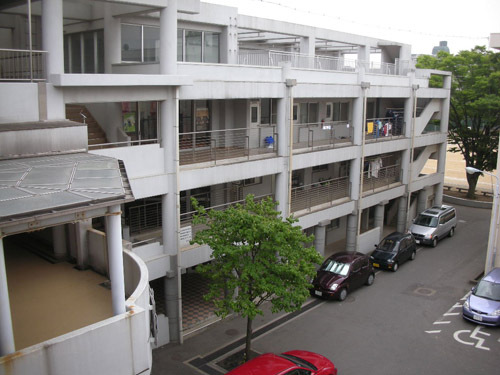 The school was much much larger and with more stories then any high school I'd ever been to in the States. Here we are in another class, I have no idea which subject though. With fear of sounding like a creepy weirdo, it was eerie how exactly the classroom environment matched that of anime's depiction of how it is supposed to be. I have seen a few anime shows in my time so I always wondered if it was way off or not. My only dissapointment was that nothing really happend like in the shows, no ninja fights, no school girls turning into super heros, just pretty much mundane and boring lecture like our classes. Some of the TUJ students sitting in the doorway watching a lecture. 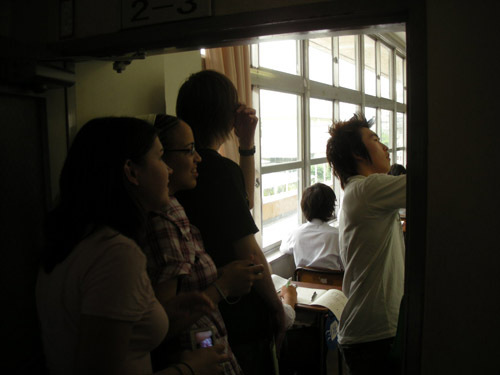 Jon towers over the Japanese students with his mammoth American height. 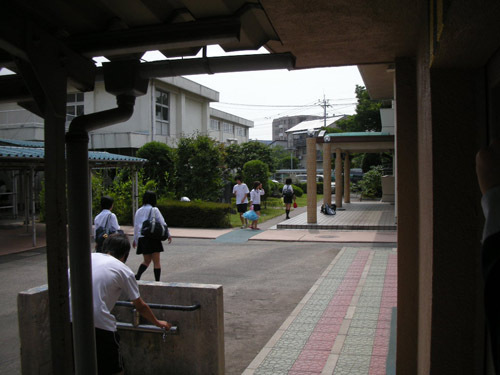 This is one of the courtyards in the school where students will meet up with friends after school or where the sports teams would congregate before practice. 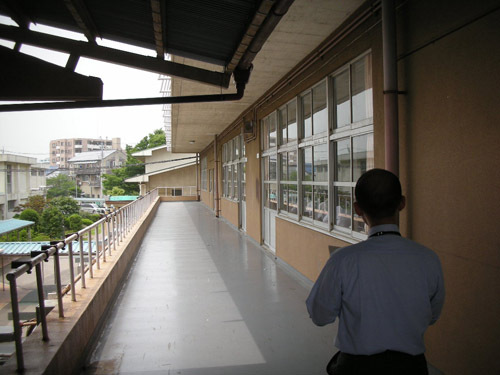 Here is looking at the end of one of the wings of the school. 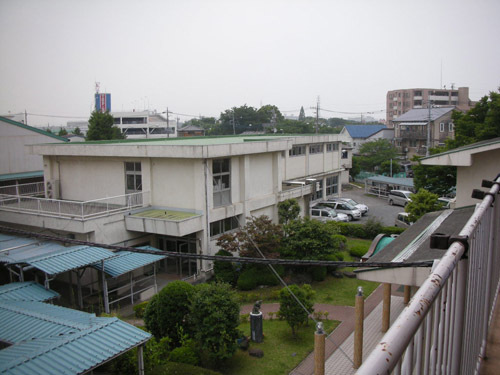 Something really cool to mention is the first floor is just one huge Kendo (Japanese Sword Fighting) dojo. It looked just like out of a samurai movie too. When I was leisurely walking by I saw kids in the full gear going at it. I wish everyday there was a massive sword fighting dojo in my high school. Alas, we just have normal football. 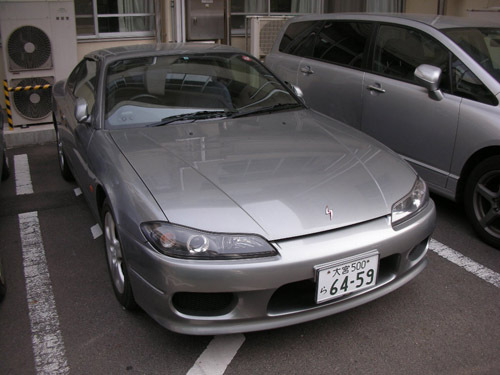 ZOMG Another teacher here has an S15. 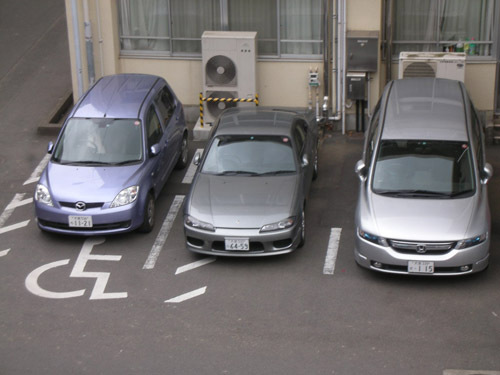 I'm gonna have to get a job here and an S15 so we can start a club. Ahh lunch time. After we sat in on the classes, we were brought back to the meeting room where we ate lunch with Japanese students. I should just say Japanese schoolgirls though cause out of the 50 or so students there, there was only 1 guy. They were really nice and brought us steak too, I felt bad since the students were eating normal lunches while we were eating a lavish meal in front of them. Me and Josh talked with a group of girls while we ate where we got a good opportunity to talk about various topics in both languages. 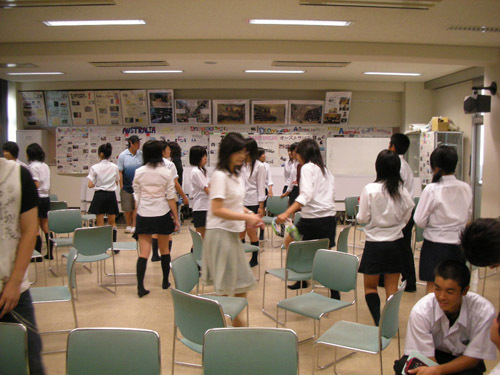 After lunch we split up the chairs into circles and took some time doing culture exchange between TUJ students and Warabi students. We were given a list of topics we had to discuss and were given time limits where we'd spend, say, 5 minutes being only allowed to use English, then 5 minutes where we were only allowed to use Japanese. Good times. Here's Josh and Jon doing their thing. After the culture exchange they gave us free-reign to wander through the school to talk to people and explore as we please. Another view of the courtyard, but a little bit closer up. As mentioned above, sports teams congregating. You can see Jon in the distance impressing the ladies. 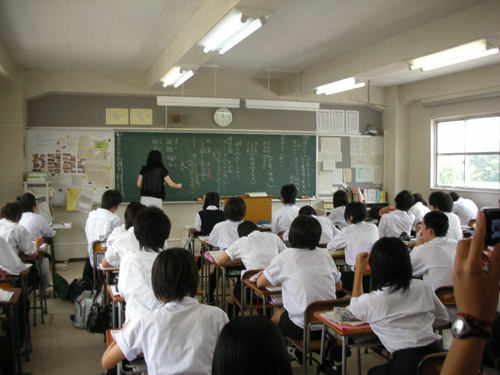 During the last minutes of the school day at Japanese school, all the students get together to help cleanup the classrooms. It was really weird seeing them all work together without complaining cause we all know damn well you couldn't get an American high school student to clean anything up, let alone work together with others to do it. 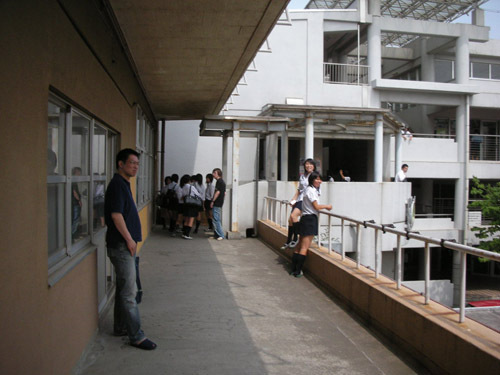 Some students here still slack off their duties, as you can see by the two girls hanging out next to the railing. We returned once again after our exploration to spend some time watching different clubs do culture presentations. 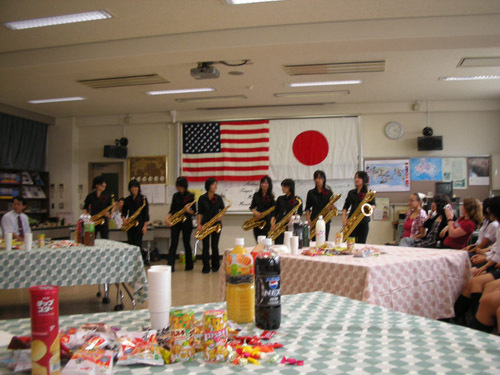 Here you can see a group of musicians doing a melody for us with their saxophones. The line of students sitting with us watching the presentation. They gave us a couple tables of snacks and juice as well. It was very hospitable of them. 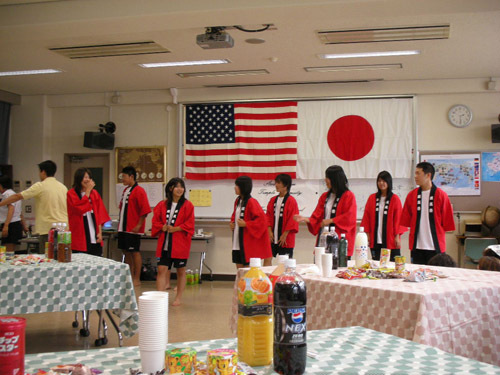 here is a club presenting a traditional Japanese dance. here are some TUJ students getting a photo-op with some of the Warabi students. 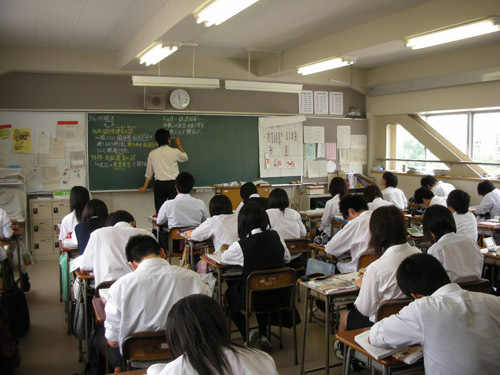 The Japanese students were surprisingly energetic and friendly. They seemed really interested to talk with us or take pictures with us. These two girls were helping with the running and announcing of the presentations. Josh enlisted these students to scream out his website's name on camera so he could look cool in his next short video. 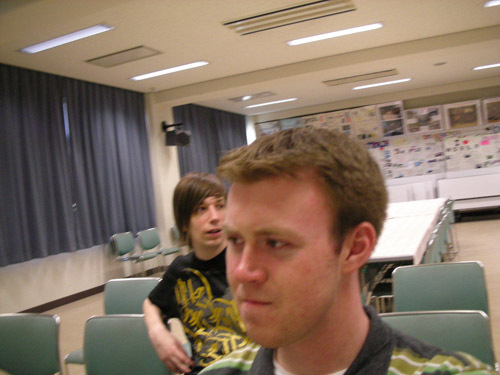 Oh by the way he makes those, search Tokyojosh if you'd like to see some quality videoblogs about Japan life. Couple more students whipping out the camera phones. Jon once again impressing the ladies. This time he's going for the dancers. 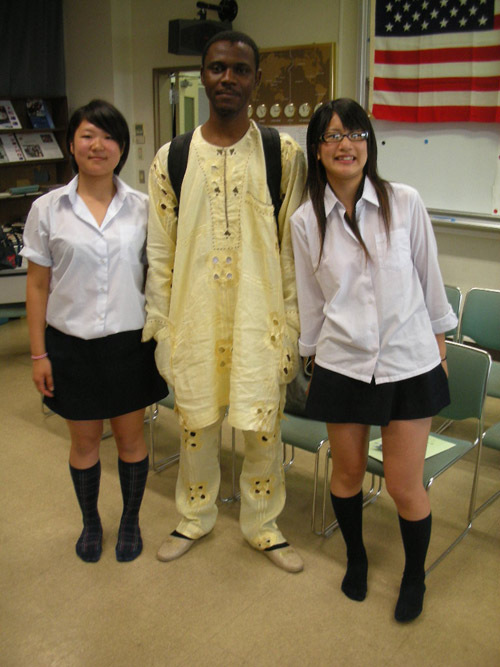 This is another student from TUJ transferred from Africa. I forget which country exactly he's from, but when you roll up in full daishiki, you mean business. After we finished taking pictures and watching presentations, it was time for us to head back to the train station and go home. I waited around in the parking lot for a little bit hoping to be able to jump the teacher/car's owner and get the keys but no dice. I guess I'm going to have to get my own. It was a really fun trip overall and we all had a good time. 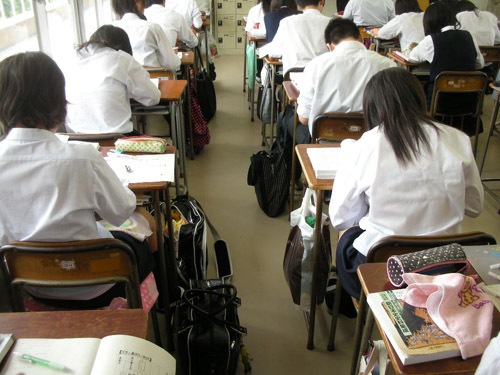 Many Warabi students, I hear, end up going to TUJ after they graduate high school. I hope I get the opportunity next year to go again for another visit.